If you've been following all the news lately on the Catching Creation Instagram and Facebook pages you will be excited to know that today is the day. 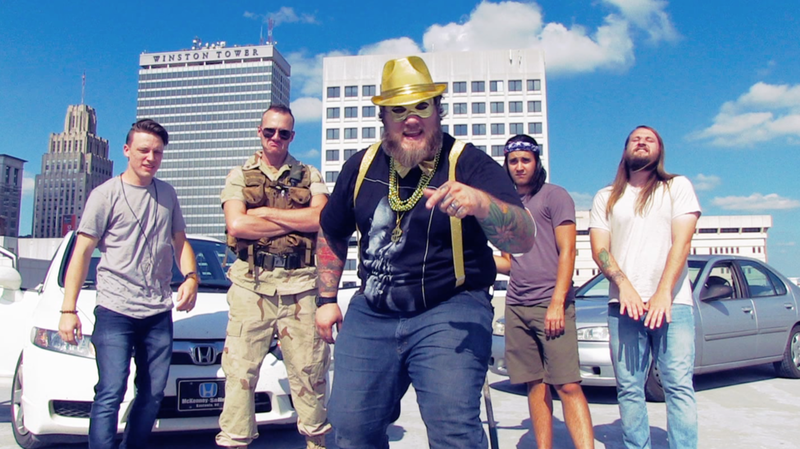 We are finally done recording "Ain't no Copperhead" hip hop song. It's all about snake identification or rather the misidentification. Every year I get countless tags on social media, texts and frantic messages about people finding copperheads. Nine times out of ten the "copperhead" is one of two harmless snakes; the Dekay's brown snake or the juvenile black racer snake. Both have patterns and in the dim twilight at a hazy wood line I guess I can understand the confusion. This misidentification happens frequently enough that as a team we decided to make this funny song about it. I hope you enjoy it and please share it on all social media platforms! What should we make a song about next? Leave a comment and let us know! This song was recorded and mixed by Stephen LaVine, filmed and edited by Stan Lake. It was performed by Daniel Charles, Chance Feimster, Thomas LaVine, Stephen LaVine, and Stan Lake. Special thanks to Barry McGee and Deric Cook for dancing their hearts out on a hot summer day for this video! If you liked this song be sure to check out our other song "Slippy Slimy Salamander" and get your wiggle on as this catchy song lays eggs in your brain. Thomas LaVine and Stephen LaVine both have lots of amazing stuff going on with their music careers, please take a second and check out their new albums and go follow them on social media! I also decided to break it up into a few smaller clips so if you can't listen to the full 16:14 minute interview feel free to check out these shorter snippets from the program. If you're like me and you've ever had a stubborn reptile that was just a picky eater then you're in luck. The guys over at Reptilinks seem to have figured out a solution to your reptile nutrition problems. 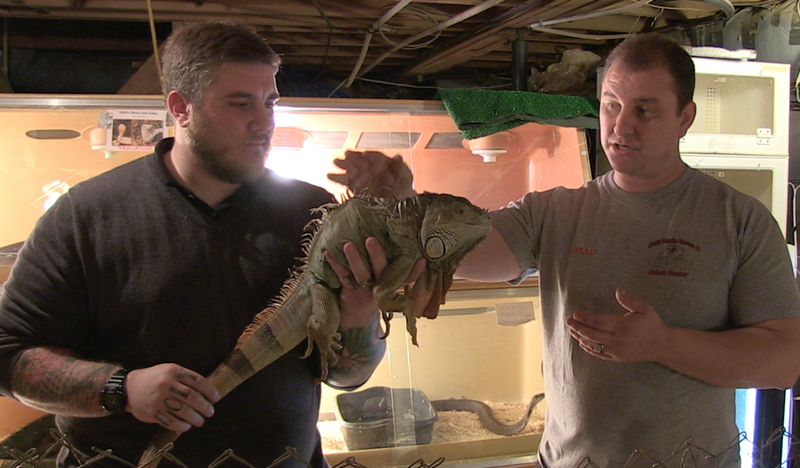 Brothers Tyler and Nick Helble founded Reptilinks with one thing in mind, reptile nutrition. These guys have made a product that uses whole prey items such as deer, rabbits and chickens and for the reptiles that need a varied diet like tegus and bearded dragons they've added fruits and veggies into a convenient little reptile link sausage. It's brilliant and it works! Check out my review of Reptilinks with some of my animals. If you want to order some links from these guys go visit them at their website at www.Reptilinks.com and tell them you saw my review! Everyone loves cute baby animals, right?! I know I do! Tonight while hanging out with my wife's parents out on their patio we heard something rustling around some bags of top soil. To my delight and everyone else's panicked surprise we found a baby Virginia Opossum. I gleefully reached down and gently grabbed him by his little prehensile tail and brought him over proudly to show the group. Once he was in the light everyone's attitude shifted and we all gawked at how cute this little bugger was! I was able to pet him for a few minutes and we let him go where we found him in the backyard and watched as he clumsily foraged for food in the dim lights from the patio. What an awesome find! What baby animals have you found? Check out this video of our interaction. 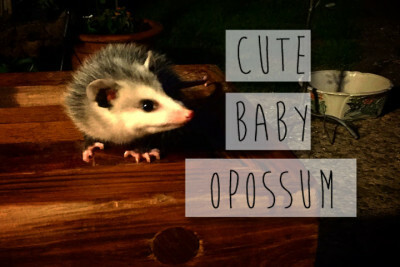 Be sure to check out our adventure from this past winter where we show you "Possum Catching 101" by catching adult Opossums and teaching all about how amazing these creatures are. If you just can't get enough of baby animals, check out this video about a Baby Groundhog that I filmed up in West Virginia. It's always an adventure and until next time stay wild! Frogs are my passion. They have been for as long as I can remember. When I was 18 I got my first dart frogs and within a few years I was breeding them by the hundreds. Back in 2005 when I deployed to Iraq I had to sell off my collection because my deployment was a year long and it's taken me quite a bit of time to get back to a place where I can properly house these amazing creatures like I once did. I have had a trio of Dendrobates leucomelas for the last 3 or 4 years and today I got in 3 pairs of other dart frogs. I got a pair of D. tintorius, D. auratus, and P. vittatus. I'm very excited about these guys. With all the updates on the animal room lately like my misting system from Reptile Basics, my light timers, and these new frogs I should be breeding again in no time. God is good! Check out the video and let me know what you think. Visit USAfrog.com to order your Dart Frogs today! Last week I had the privilege to visit Chad Griffin of CCSB Reptile Rescue in order to purchase a rescued Sulcata tortoise from him. While we were there Chad graciously agreed to let us interview him and film his operation. I was like a kid in a candy store, around every corner there were amazing creatures happily looking on as I explored the expanse of Chad's basement where they were housed. Chad's rescue, CCSB, serves as a place or refuge for animals that are often feared and misunderstood. Many of the animals in his care were from coordinated raids by local and state law enforcement agencies. Often people will take on animals that they are ill equipped to care for and whether they're injured, seized, or just surrendered to CCSB, Chad cares for them all. We got to witness everything from harmless chameleons and boas to the potentially fatal cobras, vipers and crocodilians. I just couldn't stop smiling. As someone who shares a passion for animals I was also encouraged that Chad and I share a faith in Jesus Christ. Chad considers himself a preacher first and his faith and integrity in this regard are unshakable. We learned that CCSB offers certification classes to help address local and state laws regarding wildlife, animal first aid and treatment, as well as many other things. This is definitely something worth checking into and I know I for one will be enrolling in one of his classes in the future. I met Chad several years ago at a reptile show and I was encouraged that I wasn't the only weirdo on the block with a love for Jesus and these creepy crawly friends of mine. I have been wanting to get a larger Sulcata (aka African Spur Thigh) tortoise for my Catching Creation programs for some time now and when I heard that Chad had a few in need of a new home I jumped at the opportunity. This amazing creature is going to be a hit with kids and families this year in my programs. I can't wait to share him with you all! Did you see our last EPISODE about my Argentine Tegu "Bucky?" Click HERE to check that out! Have you seen our "Possum Catching 101" video and article yet? Click HERE to check that out! Have a great adventure and remember Jesus Loves you! So in today's lesson entitled "Possum Catching 101" I will discuss the do's and don'ts regarding the capture of Virginia opossums aka the 'possum. While preparing for this episode I scoured youtube to see if I could find anything on the proper technique for catching Virginia Opossums. Sadly there didn't exist anything even remotely close. There were several shaky low quality videos of vertically shot cell phone footage but nothing remotely educational. I took this as a challenge to myself and the Catching Creation team and we set out on our mission to bare hand catch possums. If you decide to throw caution to the wind, call up your adventurous friends and launch into a full scale possum wrangling adventure, you're going to need a few things. For starters you really want to have at least one other friend with you. Someone you can trust in even the most dire of possum related injuries, someone to corroborate your story to the cops and most importantly someone to hold the flashlight while you run giggling toward the toothy marsupial. I would suggest a good pair of leather gloves to protect your fragile little hands from the razor sharp teeth of the Virginia opossum. Long sleeves will help prevent any bites and sneaky claw slashes to your arms and they will make you look cool too. Long sleeves are in, didn't you know? It is winter after all. One item that is a must for a successful possum expedition is an all terrain vehicle. Whether it's a four wheel drive SUV or, as in our case, an ATV like the TERYX that we used in this episode; you're gonna need wheels. Lastly you're going to want to find some pasture land that has been recently fertilized with the most aromatic chicken fertilizer available. If you don't live in close proximity to a pasture and have the misfortune of living in an urban or suburban area, have no fear, just look for the most raunchy dumpster you can find. You will be sure to find hungry possums behind a local McDonalds scavenging for stale indestructible fries and left over McRib trimmings. I will offer a word of caution, however, for those city dwelling possums. Those guys can be sneakier than their country cousins and the urban possums have been known to carry switch blade knives, so be on your A game when dealing with those wily creatures of the night. Above all else make sure you treat the animals with respect, keep safe while observing these amazing creatures and have fun! This has been Possum Catching 101. Happy hunting. Do You Live Like A Feral Cat? Have you ever driven behind a restaurant only to see massive quantities of feline scavengers? When a cat looses its desire to be captive and domesticated it will revert to a wild, or feral state. In many cases they retain some semblance of their former life in the first generation, but their offspring are often so wild they are untamable. This can lead to all sorts of trouble for both cats and people. Feral cats are a destructive, disease carrying menace that often preys on native wildlife and destroys the ecology of native species. The fate of feral cats often includes capture and detainment in shelters, euthanasia, disease, and harmful interactions with traffic. If they would stay close to the hand that feeds them they would enjoy the safety and provision of a loving home, but when they decide to go wild and do things their own way the outcome is much more destructive to them. The same is true of the people of God. When we are in relationship with the Lord we can enjoy the comforts of our loving Father, but if we are not in covenant as believers with Jesus then we can only expect destruction. Do you live like a feral cat? If you liked this devotional be sure to pick up a copy of “Whispers In The Woods” to have a collection of 52 similar devotionals for your spiritual growth and encouragement. ClickHERE to order a copy! Are You Obedient Like A Dog? If you have ever spent time with a well-trained and good-natured dog you can understand the joy they bring to us in their obedience. The situation seems to be quite the opposite when you encounter a dog that is lacking in proper training. The same is true for human beings. When we make a profession of faith but lack obedience to Christ it creates an atmosphere similar to the wild dog. People tend to remember the crazy behavior and abrasive experience and it takes quite a while to repair the damage of disobedience. 2 John 1:6 says, “And this is love: that we walk in obedience to his commands. As you have heard from the beginning, his command is that you walk in love.” When we walk in obedience to Christ and follow His commands we are truly showing the love that He demands of us. When we truly understand the teachings of Jesus and are obedient to them, we can genuinely walk in truth with the love of Christ. Are you obedient like a dog? Check out our newest episode "Life and Death in the Sandhills" In this episode we travel to one of my favorite spots that we often frequent. We found a cottonmouth, corn snake, dead rattle snake, and other things. I hope you enjoy our adventure! Remember to SUBSCRIBE to the youtube channel and be sure to leave a comment on it too! You can find us on Facebook over at www.Facebook.com/CatchingCreation Go ahead and give us a like over there too! In this week's episode of Catching Creation we travel to Iredell County, North Carolina, to Chance's homeland to ride ATV's, play in creeks, learn about plants and see some cool snakes. We learn that snake's aren't evil and we can easily determine whether or not a snake is venomous by a few key features by showing a copperhead vs a northern water snake. Some of those characteristics include shape of the eye, shape of the head and pattern. Chance teaches us about colocasia plants in the "plants with chance segment" and I get punked by a horse. Come be a part of the adventure and subscribe! Recently I had the opportunity to drive down to one of my favorite spots, the Sandhills of NC, to look for wildlife. I was fortunate enough to find a snake I had previously only longed to find. The Southern Hognose snake, similar to the western hognose that I use in my programs. Like all hognose snakes, this guy puts on an amazing threat display and it did not disappoint. These guys are getting increasingly more rare in NC due to habitat loss and other issues like invasion of fire ants in their habitat. I look at these amazing animals and thank God for his creativity. Only a loving designer could create such a remarkable animal! If you live near Clemmons, NC you should come out and visit Sweet Frog Yogurt at 6289 Town Center Drive to support Catching Creation. They have graciously allowed us to participate in a fundraiser at their store to support our ministry. All you have to do is mention Catching Creation on April 12 before you check out and we will get a percentage of the sales. How cool is that? Please tell your friends and share this post! I will be there with my animal buddies at 5pm to do a presentation so be sure not to miss it! I found this northern water snake, nerodia sipedon, in Winston Salem today while out for a hike around Lake Katherine near the Reynolda Gardens. He was out sunning himself approximately 15 feet from the water. I am pretty sure I found this snake a few times last year as it frequents the same basking spot time after time. Very excited to have found it today. WOO HOO. 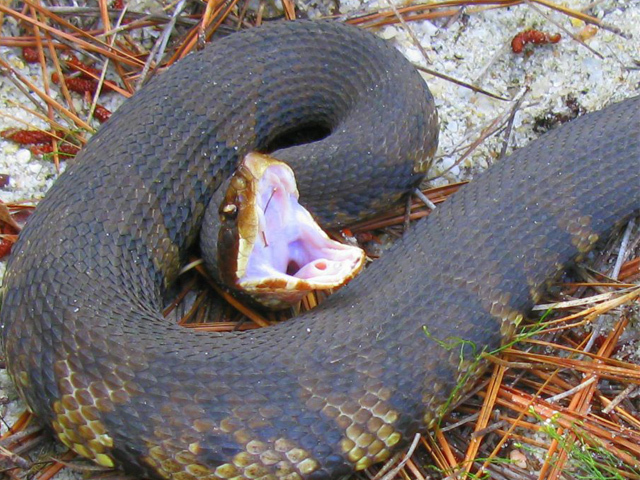 These snakes can be easily confused with snakes like the cottonmouth and copperhead who have a similar pattern and or lifestyle. This guy is absolutely harmless and a beneficial non venomous snake. You can tell that he was designed for semi-aquatic life by the positioning of his eyes more towards the top of his head. This allows him to sit in the water with less of his body exposed. Even though people will often confuse these guys with venomous snakes we know that his head doesn't have the characteristic arrow shape, his eyes have round pupils unlike venomous snakes whose eyes are situated with vertical slit pupils. These snakes are great aquatic predators and feed on fish and amphibians primarily. What a great find! Check out this gorgeous and tiny anuran reveler, the spring peeper doing what it does best. A spring peeper calling is one of the best sounds I hear every winter. This small frog makes a big sound. 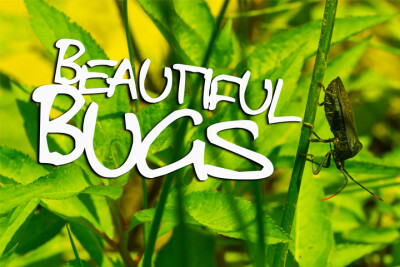 They typically grow to be approximately 3/4 to 1 inch and females will get slightly larger. They have a distinct X marking on their back giving them the species name "crucifer." As I love to point out so often, spring peepers carry their crosses, do you? A Lizard Can Be Regenerated, Can You? Have You Been Redeemed Like A Shelter Pet?